This is Epic! (Read to the end & watch the video! I PROVE that she was IN her office!) In a little over two weeks, my friend, Senior Airman Brian Kolfage, has raised over $19 million to build a wall on our border. Brian lost both his legs & right arm in Iraq in 2004, and despite that, he is still serving his country, trying to keep us safe. Airman Kolfage made his second trip to Washington D.C. a few days ago to finish putting together the team that will help get the wall on our southern border built. Some major political players, elected officials, and captains of industry have joined him in his effort. Kolfage was in D.C. last week for talks with elected officials & others regarding how the money would be spent on the wall. He returned to the capital on Wednesday to meet with high-level powerbrokers & to finish assembling an all-star team that will help make the wall a reality. Then, on Thursday, Pelosi was elected Speaker of the House. After she was elected, reporters asked her about funding for the border wall. True to his word, Airman Kolfage showed up at Pelosi’s office yesterday to collect her one dollar donation. Stephanie Hamill and others from the Daily Caller accompanied him to take video of the encounter. In the video below you will see one of Pelosi’s staffers tell Brian, “we’re having a private event right now” after he told her he wanted to meet with Speaker Pelosi. The staffer added that she would double check what was going on. “Private event” is important & I’ll explain why after the video. Share this if you support Airman Kolfage & think Pelosi is a coward! Now, most of us didn’t know whether Pelosi would actually meet with Brian. You can see in the video Kolfage says that he was told she would be at her office. Then when he arrived & said he wanted to meet her, a staffer said “they” were having a “private event.” The staffer didn’t say, “Speaker Pelosi isn’t here,” she said, “we’re having a private event.” It wasn’t until the second staffer arrived that Brian was told Pelosi wasn’t there. But after a little research on Pelosi’s “private events,” I’m going to say she absolutely was there! I Googled “Pelosi private event” and several articles came up that have Pelosi attending “private events,” and usually it’s with donors. CNBC reported that Pelosi attended a private event back in November of last year with top donors & former NYC mayor, Mike Bloomberg. The Oakland Press reported of a private fundraising event Pelosi attended last October, and the El Paso Herald-Post reported she attended a private event (probably a fundraiser) in August with a Democrat candidate from Texas. Congressional staffers & aides don’t have “private events” for themselves. No one cares about them. They aren’t out raising millions for their party, the elected official they work for does that. Private events are held for those in power, usually to raise money, or to reward those who gave money with a meeting with the politician. Brian also sent me a text saying that he saw Rep Joe Kennedy & others enter Pelosi’s office as he was waiting. Was Kennedy just going to “hang out” in her office while she wasn’t there? Yeah, right. 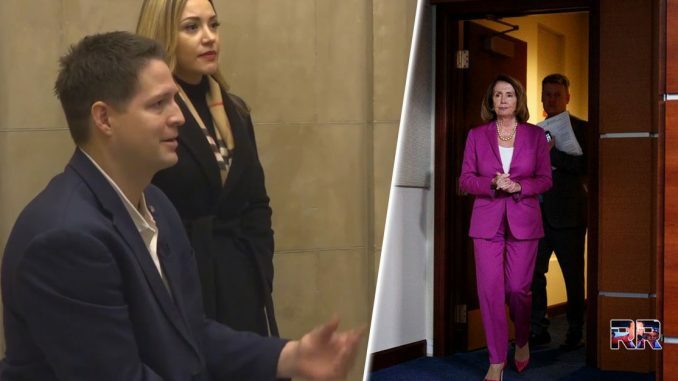 I’m going to say it right here: Pelosi LIED, she was THERE when Kolfage showed up. She was HIDING! She couldn’t face him! She’s a total coward who wouldn’t meet with a triple-amputee war hero who is trying to keep Americans safe from criminals & drug gangs! I’ve known Airman Kolfage for years & he is an amazing patriot & hero. Pelosi totally disrespected him by not even coming out to meet him. Follow Jeff on Twitter HERE! He is so awesome! Pelosi should be at least held to reply to the message that he left! Our family gave a donation to the wall. Ours was not huge, but it was what we could give. I encourage everyone to participate in this wall fund. Talk about immorality. Sounds like Nancy knows all about. She is a disgrace beyond to the people of the United States. Both her and Chucky need to be behind bars. Sorry couldn’t edit last post. She is a disgrace to the people of the US..
Pelosi is a coward to meet with Kolfage, a triple amputee. She said she would give $1.00 and now she is hiding and not paying. Pathetic Coward & Democrat. Nancy Then why do you have a wall around you home, Obama’s have one and the Clintons too. Take a look at a lot of the movies star homes. They have them too. For us Americans you don’t want us to be protected. I hint this is double standards. Wake up and build the wall please. I think this is double standards. If we all remember she made a remark about she didn’t care what the American people think.